Welcome to the dragon information section, for indepth studies please refer to wikipedia or other sources, herin this page I simply attempt to formulate an introduction to the basic types of dragons- Western dragons, Eastern dragons, Seadragons, Wurms, Wyverns, etc. While providing brief descriptions and information on each type of dragon alongside some information on their roles in history. I then transition to briefly discussing a few dragons from mythology in a section featuring a small collection of dragon legends and myths. Most came from the book - Dragons a natural history by Karl Shucker, others came from online resources. This section is designed to supplement this sites Dracopedia in giving a small glimpse of the role dragons have played in human culture around the world. Enjoy! This will most likely be the hardest or easiest section to make depending on my mood. There are so many different types of dragons to list that this page will always be a growing project, I expect this whole section will someday have many pages and I hope it does as you read about dragons here I too will be learning from this- I still can not believe I know so little about the creatures I love so much. A dragon... What is a dragon? Having researched the history of dragons I have found that they can have many different appearances depending on your location in the world. But for the most part the two most popular forms are the Western Dragon and the Eastern Dragon. The Western dragon was the basic winged dragon that was often sighted in England it was often described as a large reptile with the head of a crocodile wings of a bat and tail of a snake this dragon walked on four legs and was said to breath fire. They were often side to be evil and were hunted by knights. Western dragons had four legs and a set of wings they were said to breath fire. Western dragons were said to be evil and were supposedly hunted as a result. Western dragons were sometimes used as crests for royalty. Western dragons were historically known for thousands of years. The eastern dragon was often depicted as a flying serpent it had no wings and was said to be able to float through the air by use of two magic extrusions on there head. These dragons were the opposite of the western dragons these dragons were often depicted as wise creatures with power over the elements. Eastern dragons had serpent like bodies and were capable of flight without the aid of wings. Eastern dragons were said to be wise powerful creatures with power over the elements. Eastern dragon designs were also used on royal garment. In China there were many dragons but there are four major dragons. Tien Lung - The T''ien lung is the celestial dragon and protector of the heavens and guardian of the gods heavenly abodes. Shen lung - was of equal importance and was the spiritual dragon the azure scaled master of storms and skyborn bringer of rain. Ti lung - was the dragon of land, stream and river, which spends springtime in heaven and autumn in the sea. Fu-ts''ang lung - was the dragon of treasure keeper of secret hoards and priceless jewels and metals within the deepest vaults of the earth. The dragons of Japan where more associated more with the sea then with rain. The dragon of Koshi - Was a eight headed dragon which had come to devour a maiden but Susan-no-wo brother of japans sun goddess gave each head a vase of sak''e and got the dragon drunk then slayed it. Hai Riyo - This dragon was portrayed with the feathered wings body and tail of a bird but still had unmistakable dragon characteristics. The wyvern is another type of dragon which usually appeared smaller then western dragons and they did not have front legs, they were apparently structured much like a bird or pterodactyl. It had no forelegs and was similar to pterodactyls. The Wyvern represented non transmuted metal in Alchemy. The Wyvern often appeared as an emblem of envy or an insignia of war. These dragons were limbless dragons they were like giant snakes but were noticeable by the draconic appearance of there heads. Wurms had no limbs nor wings they where like giant snakes aside from much thicker scales and a horned dragon head. Lindorms and orms where similar to wurms except that they often had one pair of legs. Similar to wurms these are limbless dragons that lived in seas and lakes. Sea serpents can be up to hundreds of feet long. Lake serpents where usually smaller but are still pretty large. The loch ness monster is probably a sea dragon if not a living dinosaur. The Ogopogo a lake monster of Canada is also most likely a sea dragon. The basilisks where small lizards (2 foot) which were somehow related to dragons, they had three horns on their head similar to a crown, it could cause great damage with a mere glance of it''s eyes. It''s breath and Saliva were also venomous the basilisk could only be defeated by three things, a weasel, a rooster or a plant called Rue. The Basilisk was a small lizard with three horns similar to a crown and was very venomous. The Basilisks sweat was poisonous, Probably had venomous skin similar to poison frogs. The word Basilisk meant "little King" in the Greek Language. The Basilisk would destroy all the land that it pasted by. The *****atrice was a small dragon-like monster about the same size as a basilisk, It had birdlike legs and the coiling tail of a serpent, Although it had a reptilian body it''s head and wings were feathered and it had the head of a rooster. Much like the Basilisk this creatures gaze was deadly. The gaze of a *****atrice can kill others of it''s kind. A *****atrice can be killed by it''s own reflection. The Hydra was a dragon with nine or more heads, in Greek mythology Hercules was forced to battle one as one of his trials, for each head he killed another replaced it. The Lambton wurm was caught by a fishermen named John Lambton he threw the monster into a well. He then changed his life around and went on a pilgrimage he was gone for many years and the wurm continued to survive in the well eventually it had grown up and was terrorizing the nearby town, many people would try to slay it but every time they cut it, it''s halves would rejoin. John Lambton returned from his pilgrimage and found that the wurm he had caught so many years ago was causing much havoc, he sought the help of an old witch who told him to make a special armor of blades and fight in the river where he had caught the wurm. John obtained an armor of blades and fought the wurm in the river so that each segment of the wurm would float away. But there was also a curse along with the wurm, after he defeated it he was told to kill the first person he saw which was his father, Instead he killed his pet dog which did not dispel the curse and every heir of the Lambton family met an early death for the next nine generations. Jormungander the midgard serpent was a dragon of limitless power, spawned by Loki the god if evil, it''s coils spanned across the earth and as far as the eye could see. Then Odin the god wisdom cast it far out into the deepest oceans. Yet the serpent Jormungander still continued to grow beneath the waves deep within it''s watery domain, beyond the realm of gods and men it grew even larger until it''s mighty coils could encircle the earth. Biting it''s tail like a giant ouroboros it was destined to stay in it''s dark watery domain until the final day of Ragnorak where it would be free to roam the earth and have one last final battle with Thor the god of Thunder. Also in Norse Mythology: Norse mythology speaks about a dragon circling the tree of life (or the north star). In Ancient Greece Queen Cassiopeia boasted she was more beautiful then the sea nymphs, this angered the sea god Poseidon and he sent his sea dragon Cetus to wreak havoc upon their kingdom. The kingdoms monarchs desperately questioned an oracle who claimed the seadragon could only be placated by the sacrifice of the queens daughter Andromeda. Andromeda was chained to a cliff overlooking the ocean and the Serpent Cetus came for her, but miraculously Persues was returning from slaying the gorgon medusa he saw the princess and her upcoming fate. He used his sword and sliced into an unprotected area of it''s skin and into it''s heart after three strikes the mighty sea dragon Cetus fell dead. On the fifth day of creation god shaped and breathed life into all the creatures of the sea, at which time he also created Leviathan to serve as ruler of the seas. No mortal weapon could penetrate the leviathan''s shimmering scales and no living thing on earth could ever hope to oppose it''s might. Nothing could cause a flicker of fear in the leviathan''s heart. Initially god created a pair of these fantastic beasts but then it became clear that their power was so much that the entire world would be threatened by a race of them. So god destroyed one of them, but as compensation for the loss of it''s partner he granted the surviving leviathan immortality. And so the great leviathan would live forever beneath the oceans of earth until the day of judgment when it would be slain by the archangel Gabriel. Appearance: Serpentine two legged and wingless. A queen unable to have children consulted a soothsayer who promised she would have children in less then a year provided she eat two onions the queen so excited by this quickly left without allowing the soothsayer to finish. She returned home and in her excitement ate the first onion without even peeling the skin the second whoever she did peel. As prophesized she did give birth the first born was a hideous monster a scaled wingless serpent - which in disgust she threw out the window the second born was a healthy young boy. Years later the young prince met his brother the lindorm out in the woods, the lindorm threatened that the prince would never find true love unless he was presented a willing girl. Many woman were sacrificed to the lindorm. Finally one knowing she would be next consulted the soothsayer who told her a secret. She entered the lindorms lair clad in many garments and asked that for each dress she shed he would shed a layer of skin, he agreed and after the last layer he transformed into a prince. Then the soothsayer finally was able to mention what the queen had not heard those many years ago, Be sure to peal the onion first. Fafnir the son of a dwarf king murdered his father for his wealth which he coveted, after gaining his fathers wealth he retreated with it to Gnitahead and jealously guarded it. But the treasure was tainted by his dyeing fathers curse, and it''s evil influence enhanced by his own hatred caused him to transform into a dragon which always guarded the treasure. Fafnir and his treasure remained this way for centuries while his brother Regin plotted to gain it, he used a warrior named Siegfried as a pawn- he had Siegfried hide in a hole beneath the path to a lake, then when Fafnir came to drink he would stab the vulnerable area of it''s belly. Afterwards Regin asked him to cook the dragons heart and he did, when handing the cooked heart to Regin he burnt his finger and licked it he could then understand the language of birds and overheard them talking of Regin''s plan to kill him, Siegfried then beheaded Regin near the carcass of his brother, He then went to claim the treasure and the curse which accompanied it. There once was a young girl named Maud who discovered a baby wyvern in the woods her parents demanded she return it, but instead she hid it and brought it milk each day, and in time the two bonded but as the two aged together the wyvern grew larger eating first wild animals, it eventually gained a taste for human flesh, a danger to everyone but Maud, the people soon decided it had to die. Maud''s wyvern was soon killed by a wandering knight named Garsten. Maud still stayed along side her dying wyvern mourning it''s death, as Garsten triumphantly rode back to town leaving behind a dead monster and it''s only friend a girl named Maud. A beastly dragon had come in from the swamps of Silene! In a desperate attempt to get rid of this dragon the local farmers fed the dragon two sheep a day, this strategy worked until they ran out of sheep and the dragon went on a rampage, soon the evil king agreed to allow the sacrifice of children, but day''s and weeks went by and it soon came time for the kings own daughter to be the next sacrifice. Aknight named George had come into that town at the moment of her sacrifice and he untied her. The dragon soon arrived and he prepared to lance it, as he neared he was suddenly stopped by giant frills of circles like eyes, he continued forward and pierced the dragons neck with his spear, the king was so pleased he allowed George to convert the entire city to Christianity. Long ago a native American tribe called the Illini tribe lived in harmony with the Piasa which ate mostly deer and other large animals, it had no interest in humans until one day when a warring tribe attacked the Illini tribe, during that battle many men from both sides lost there lives and although the Illini won the battle the worst was yet to come. The Piasa witnessed the battles and being a carnivores creature the bodies where a tempting snack for it, and it soon discovered that it liked it''s new found meat. It soon became the mortal enemy of the Illini tribe and a great meeting was held, after hours of debating plans to kill the Piasa one risky plan was decided upon, they decided to lure it to the ground where twenty of there greatest warriors would slay it. A brave named Massatoga volunteered to act as bait to lure it down. He headed towards it''s lair singing a tribal chant and when the Piasa spotted him he ran to an area with a lot of trees, when the Piasa landed and folded it''s wings the warriors pummeled it with arrows and hacked at it until the dragon was no more. Quozalcoatl was the god of the Mayans and the Aztecs it has many similarities to the eastern dragon. It was said to be a feathered serpent that could fly it also had a human form which it used to guide the people. I am still researching this and will include more later. Was A god of both the Aztecs and the Mayan''s. The hydra was a dragon in Greek mythology. Hercules was said to have fought it. It was a multi headed dragon and for each head cut off a new one took it''s place. Hercules defeated the hydra by burning each neck with a torch before a new head could grow.
. The Hydra was a mythological dragon that had several heads and was killed by Hercules.
. That myth is the only account of a hydra that I could find. The hydra had nine heads and for each head which was removed two would take it''s place this dragon was defeated by Hercules who melted the stub of each neck before new heads could form. Side Note: It should also be added that Hercules'' 11th task involved venturing into Athena''s garden to get the golden apples. A dragon guarded those apples and it was killed so that Hercules could get the apples. Athena put the dragon''s body into the sky and created the Draco constellation. Appearance: Two fore legs, serpentine body. Two elder gods Apsu and Tiamat became increasingly angry with new generations of gods apsu wanted to get rid of them Tiamat tried to calm his rage but reluctantly agreed to help him Apsu was later captured and killed after this Tiamat became enraged she created an army of fishtailed and scorpion tailed warriors she also gained the support of other gods, then she took on the form of a giant semi dragon. The other gods unable to challenge such a task agreed to make Marduk the supreme god if he could vanquish her, he agreed and sought the help of a hurricane, he caught Tiamat in a net and pummeled her with arrows, when Tiamat opened her enormous jaws to eat Marduk the hurricane flew into her and prevented her from closing her mouth. Marduk shot an arrow down her throat and into her belly Losing no time he sliced apart her internal organs and split her heart in half he continued until Tiamat the embodiment of chaos was no more. Marduk was now the supreme power, he cut the corpse in half and used one half to make the heavens and one half to make the earth. Appearance: Four legs, winged, serpentine body. Beowulf the famous Danish king fought a dragon, In Beowulf''s later years now an old man he was asked to slay a dragon which was ravaging the country. A thief had stolen a cup from the dragons hoard the dragon enraged began it''s rampage, Beowulf arrived and fought the dragon alone but was unable to defeat it. Beowulf and the dragon where to evenly matched, Beowulf about to lose, was saved by his friend Wiglaf who stabbed the dragon allowing Beowulf time to finish it. Beowulf later died of his wounds and gave Wiglaf his kingdom. The dragon''s body.. A compilation of many species and animals combined into one ultimate creation, having never seen a living dragon and having only artwork and ancient descriptions to go by many have tried to explain the biology of a dragon. I know I''m no different, so here''s my thoughts. Going by accounts I have read in mythology an average western dragon would''ve been about twenty five feet long. and pretty tall too, I say that because I am unable to determine an appropriate height. It would have had a large wingspan and would''ve have been a glider much like the pterosaurs. Yes, I have a habit of comparing dragons to the ancient pterodactyls and pterosaurs. It would be illogical for a creature of that immense size to flap it''s wings like a birds, it would instead fly like a glider the wings could be flapped be not rapidly thus a dragon would most likely have hollow bones and a light body despite it''s immense size. If the dragon was a glider it would probably live near mountains and cliffs of a large altitude so that departing for flight would be less struggle. A dragon would be a carnivorous predator that would hunt much like a hawk circling from the skies, and upon finding suitable prey it would dive down and grip it in it''s claws. If the prey were to large to lift the dragon would most likely deliver a deathblow by biting the neck. A dragon would most likely hunt small prey which was light. An infant dragon would hunt small dogs or wolves, an older one would hunt goats and larger prey, an adult would most likely prey on cattle and large mammals. Due to the fact that they are described as reptiles they would probably be cold blooded and remain dormant during the winter. In mythology dragons colors weren''t as varied as they are in today''s literature but in any case I''ll point out that most reptiles evolve to their environments and dragons would be no different thus a dragon living in a forested area would have developed green scales while a dragon living in a mountainous region could have yellow, tan, or copper coloring. Did / Do Dragon''s Exist? Anyway, the main thing that I wondered was, could dragon''s still exist today, after reading numerous books on Cryptozology (study of legendary creatures) all I''d found was info on half a dozen sea serpents some supposedly dinosaurs in Africa and the Amazon and one story about a winged reptile spotted in Arizona in the late 1800''s. But I did discover the before-said rumors of pterodactyl sighting''s in Texas in the late 1970''s and some rumors of flying reptiles in African jungles. Please note that due to numerous circumstances none of these stories were ever confirmed, but it''s still pretty interesting. Pterodactyls are extinct so if these stories are true what were people sighting? - On June 7, 1890 All of Tombstone was in an uproar when two cowboys rode into town with implements of skin from an enormous flying creature. The cowboys claimed to have won an epic battle against a giant flying lizard to back up their boast they displayed one of the monsters wingtips. They claimed to have sighted the creature from a distance. There appeared to be something wrong with it for it would only fly a short distance then land panting. The two men on horseback pursued the monster for many miles with their Winchester rifles the creature then turned on them but owing to it''s exhausted condition they were able to stay out of it''s way and finish it off with a few good shots. It had an elongated eel like body some 92 feet long It''s two legs were attached to it''s body in front of the wings. The 80 foot wings were of thick translucent membrane devoid of hair or feathers The head was about eight feet long with jaws thickly set with strong sharp teeth and giant protruding eyes the size of dinner plates. In 1997 a California based organization called the society for the investigation of the unexplained (SITU) took an interest in the eighty year old Tombstone Epitaph article. SITU wondered if there had been a follow up story, a check with several historical buffs revealed that there had indeed been a follow up article including a photograph. The photo SITU investigators were told showed a bat like monster strung up against a barn with six men arms outstretched fingertip to fingertip to show it''s size. The arm lengths of six men would be about 36 feet far short of the original 80 feet but still far larger then the wing span of any living thing that has flown since prehistoric times. Furthermore came the tales of living dinosaurs which, I think is getting a bit closer.. Let''s start with Mokelembembe which is said to be a giant reptile in the dense jungles of west central Africa, It has been said to be seen often by native tribes drinking near watering holes. Recent and past investigations had found many tracks and strange tales but never any definite proof, it (Mokelembembe) has been described looking like a Brontosaurus, but sense very few witness''s have seen it''s full form some of which may have been exaggerated. Who''s to say that a small clan of surviving dinosaurs (or dragons...) is not still surviving, in the uncharted jungles and wilderness far from the constructions and chaos of man? The next example of a possible living Dinosaur (or dragon) is the Sirrush, (active researchers of dragon''s would recognize this one) Around 600 BC carved into the Babylonian Archeway of the Ishtar gate were Giant bas reliefs depicting three animal''s in different sizes and actions. The Apocrypha''s book of Bel and the dragon relates a story that in the temple of Bel Lord oft the world, Nebuchadnezzars favored god, the priests kept a "great dragon or serpent" which they (the Babylonians) worshiped. Anyway, did you notice how the Sirrush was portrayed on the Babylonian gate with living (although now partly extinct) animals? and how in the same region they worshiped a living reptilian serpent/dragon? If dragons don''t exist what the heck were the worshipping, A crocodile maybe? I doubt they were common, in that region I believe. So then what? My other thoughts would be Uneducated and Irrelevant, I know to little to formulate decent theories at this time aside from the beliefs expressed in my stories and the dragonrant''s section, but then those do not concern dragons of this physical world and therefore they too would be irrelevant. In other words my theories should be expressed when I have obtained enough knowledge to make them. Below is a list of the books and sources which I used in the past to gather the information for the Dragon this page and the Dracopedia section. 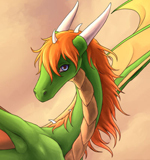 Please visit Dragon Valley''s WebLinks Section for a wonderful list of sites with further information and resources regarding dragons in all their forms and deversity.